Splashback – Save Leith Waterworld: a springboard? Yesterday Splashback! handed in the petition with 6200 signatures to Lord Provost George Grubb, following our deputation in support of the Green's motion to delay the sale of Leith Waterworld for six months to allow a potential credible community bid to be developed. We, the undersigned, are dismayed by the decision to close Leith Waterworld. We believe this would be a hammerblow to Leith, and to children, families and people with disabilities from across the whole of Edinburgh. We believe the £300,000 required to keep the pool open each year is an investment in the health and wellbeing, confidence and future of our community. We demand the Council reviews the 2005 decision to close the unique facility and investigate all possible avenues for retaining the amenity and keeping the pool open for the Edinburgh public for the future. The motion was carried with a minor amendment by the administration by 45 votes to 11. 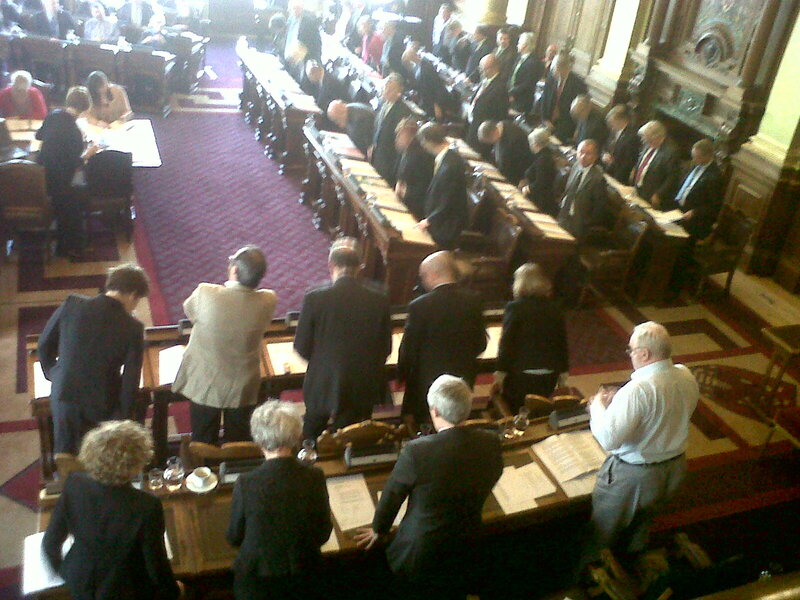 Finally after two months of campaigning, here (in the pic) are the Councillors standing up for Leith, as they make their decision to support the possibility of a community bid. NB the Big Society Tories sitting down in the top left!